That was a lot of fun. So here he is, Specter 2.0, a MOC comprised of parts from three heroes and two villains. His weapon is a twin-barrel hyper-ionized steam cannon that both suppresses fires and causes immediate surface corrosion on all ferrous metal parts, bringing machines and robotic enemies to a literally grinding halt. A specialist in stealth, he mostly operates at night and in shadows. 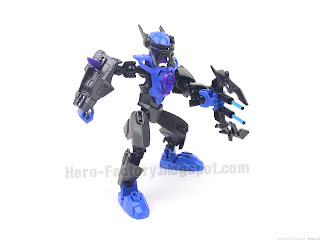 Can't MOC with 2011 Hero Factory sets? Ha! 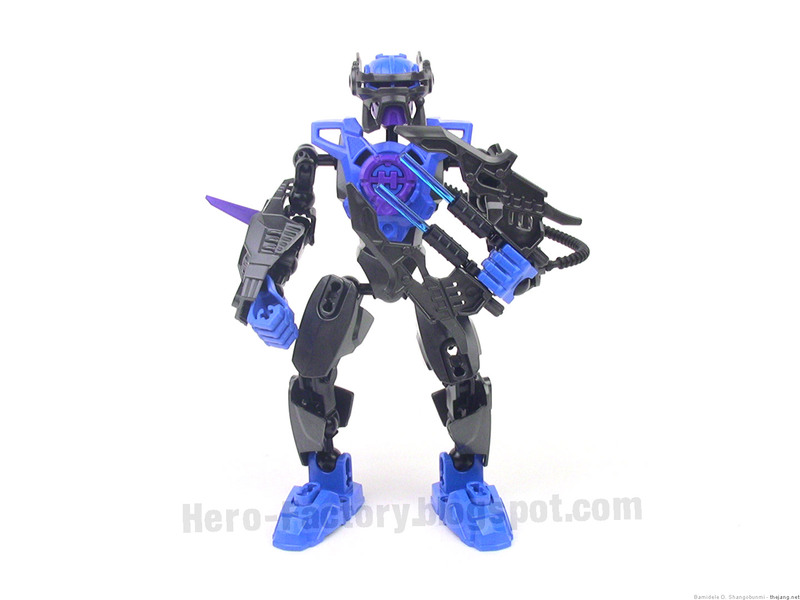 Instead of following the obvious course of using the new parts in older Bionicle-styled creations, I've decided to go the easier route for awhile and see what can be built with 2011 style and theme by swapping parts, as Lego had hoped. As it turns out, there's a lot that can be done without even getting at all tricky with them! More to come. Many more. I was disapointed to find out it was only a moc. It is really cool though! you did a great job! The fact that you used ribbed double axle connectors on the one weapon gave it away to me that it was an MOC. 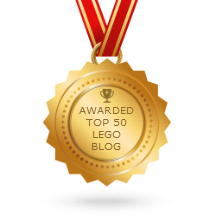 Lego retired that version of that piece awhile ago. Great colour scheme! Really epic, you know? if u can make how to colors and parts (like wath sets etc.) i would be LIKE HAPPY FOR EVER AND LIKE U.
OK, so my son and I built Spectre last night. We only have one of each of the hero factory sets to work from. The only pieces we couldn't find were the black hose and the pieces that hold the blue lightsaber pieces. In lieu of the black hose, we used a blue hose. In lieu of the 2 missing black pieces, we used gray pieces found in Jetbug's helmet. If you can say which kit had those 3 pieces, I would much appreciate it. I would like that set even though it's not real. There is a Hero Creator online and it says we can even ask our custom heroes to be mailed to our homes. I might do that with Spector. But I can't make my Spector the same as yours since there are some pieces and color crisises. what did u use to make it (what heros)???? This is the best hero factory moc I have ever seen(and I have seen a lot). Can I make this without Nitroblast??? U completely fooled me! I thought it was a 4.0 hero! BTW: Has anyone seen a 4.0 pic yet? If so where? 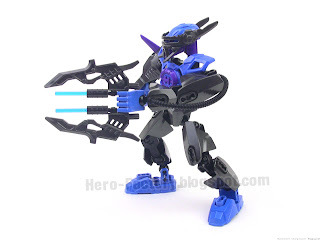 on Lego Digital Designer i created a near perfect replica of specter 2.0 (with a few modifications due to lack of pieces) i also attached some armor to his back (so he isn't as exposed) and added more purple spikes. I couldn't however find the black tube so excluded it from the model. the overall cost was about $26. which is pretty good for such an awesome hero. P.S. i didn't take any credit for specter 2.0 at all and have not posted it anywhere. You said in the vid that you used Fire Lord, Nitroblast, Surge 2.0, Evo 2.0 and Breez 2.0. you did use pieces from all of those guys, but, which one of those guys come with a black hose? Which one of those came with those twin connector pieces on his weapon? Who? Who? WHO??????? What the heck comment above me. better than rocka 2.0 replica edition! @Anonymous those 3 pieces are probably from bionicle sets. Funny, I just made a MOC named Halo 2.0 and I just found out that it is almost identical to Specter. Halo does not have the big armor piece on Specter's right hand or the black hose. He features a tank arm like Evo Breakout Edition and uses white where Specter uses purple. instead of four gunmetal armor pieces on Specter's legs, Halo uses two gunmetal(the lower ones) and two blue. His gun is the same, except it doesn't have the minifigure lightsabers in the middle. Halo also has a shoe on his back, like the later Heros. Finally, Halo is a master of stealth and shadow, just like Specter. Although I made this just recently, I swear that I did not copy Halo off Specter. I just found Specter today and was amazed by the similarity.